And Now, for Tuesday. . . 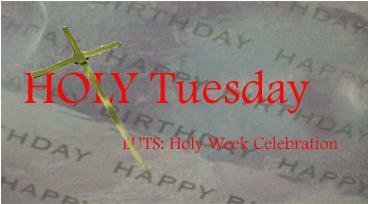 This is Tuesday in Holy Week. We met again in a place of quiet and candlelight. In the Night Prayer service, there is this line that catches me every time we sing it: Guide us waking, O Lord, and guard us sleeping, that awake we may watch with Christ, and asleep we may rest in peace. Every time I hear it, I am caught by the truth that there is no place and no time when we are not within the providence of Christ. Whether we know it or not. Whether we receive it or not. Christ’s loving disposition towards us holds us. Tonight our pastoral intern introduced each of the three lessons with a few words to help us connect this day and these lessons to what will come later in the week. Here’s what captured me this evening. We read a little further in John 12, past where we stopped in the reading last night. Unless a grain of wheat falls into the earth and dies, it remains just a single grain; but if it dies, it bears much fruit. And then there were words about the darkness. She reminded us that there is darkness and despair that permeate the events that lie before us. She proclaimed that even in the midst of darkness, there is the promise of light and life and resurrection. In those moments, as I heard the wise words from this young leader, that canticle that I have sung so often came flooding to my mind even before we had a chance to sing them; Guide us waking, O Lord, and guard us sleeping, that awake we may watch with Christ, and asleep we may rest in peace. She ended with these words: wisdom and redemption can come from none other than the crucified and risen Christ; the light dwells among us, in the place, this very night, to lead us on a journey through the darkest time and darkest roads of life, even as we await in eager longing for the risen Lord. The seed that is planted in the cold, dark ground will sprout. There will be life. This entry was posted in Uncategorized on April 15, 2014 by Jim Honig.